Aqua Legion UK Ltd is a Legionella Control Association Registered Company. We have been registered with the Legionella Control Association since our incorporation and we continue to follow both the Code of Conduct for Service Providers and the LCA Standards For Service Delivery. 1) Legionella Risk Assessment Services for – Hot and Cold Water Systems, Evaporative Cooling Systems, Process and all Other Water Systems. 2) Hot and Cold Water Monitoring and inspection Services – All systems. 3) Cleaning and disinfection services – domestic hot and cold water systems. 6) Legionella Analytical Services – Sampling, Laboratory Analysis, Interpretation of results. 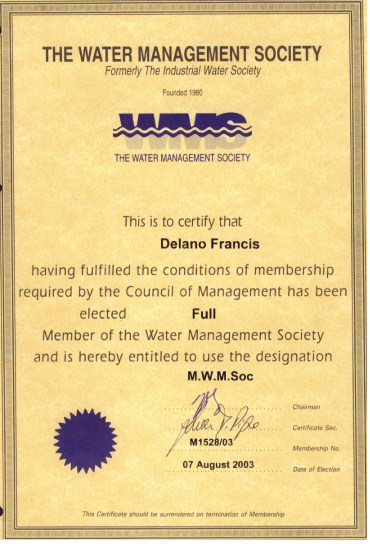 Our Managing Director and Senior Consultant has not only been a Member of the Water Management Society since 2003, but he has also been elected as a Member of the Management Council since 2008. Most recently, in 2016, he was elected a Fellow of the Water Management Society. Educated to Degree level and having completed the full Water Management Society and Legionella Control Association Training Matrix of the past 16 years, our clients can be rest assured that we are always up to date with the latest industry information, legislation, news and technologies. In 2008, our Senior Consultant was a Finalist and commended as Business Person of The Year in the Natwest Sponsored Archant Thames Gateway Business Awards 2008. 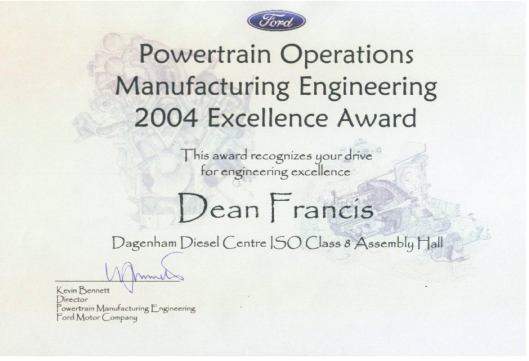 In 2004 Our Senior Consultant received an Award from Ford Motor Company for his personal effort towards Engineering Excellence. He was involved in the provision of indoor air quality monitoring and water quality monitoring to cover many Ford sites including the site which houses the two large wind turbines along the A13 in London. Aqua Legion UK Ltd is committed to offering effective and priority Independent Legionella Risk Assessment Services throughout London.